Seed Art at Nellie Stone Johnson Family Night! I just love walking into Nellie Stone Johnson Community School, they really do put their students first. 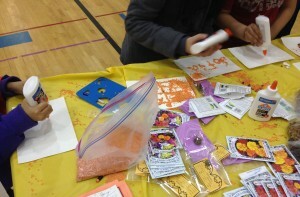 Yesterday was the school’s Family Night and the halls were buzzing with excited chatter from youth and their families. The school band performed and it was awesome to see that Youth Farm All Star talent goes beyond the farm and kitchen and includes music! At our table, Youth Farm LEAD and Volunteers helped young people celebrate literacy and art by making letters, words and designs with seeds. It was great to hear one parent talk about how her daughter came home and went through about 2 dozen eggs one week perfecting our scrambled egg recipe that we made during our cooking class. She loved how engaged her daughter is now in the kitchen! And I met a young second grader whose eyes lit up when she found out that we plant and take care of tomato, pepper and strawberry plants. She gardens with her dad and couldn’t believe that there was a program where she could do that with other kids in the neighborhood. Future Youth Farmer right there! As we were leaving we had a few unclaimed Seed Art projects and when the school’s Social Worker saw them, she immediately offered to pass them out to the students the next day. All of this shows just how dedicated the staff are to the students of Nellie Stone, which makes the night even more special. Hooray for Minneapolis Public Schools! Kara Bennett liked this on Facebook.